So, two out of three good races yesterday (and the middle one was *terrific* but I was yellow-flagged again while in second and therefore forced to retire). Going into today was in a three-way tie for 4th with Aussie Brad Taylor and Benoit Meesemacker from France. Ari Barshi from the Dominican Republic was in 3rd 12 points ahead, but looking vulnerable after his 12, 22, 7 finishes yesterday. Lots on the line, with two races today deciding everything! Another meh start at the boat, requiring me to tack fairly soon onto port. Not a good situation because the left was very favored. Rounded in the 20s, gained some on the run then bee-lined it to the left corner on the second beat. Gained a few places, but more importantly, a lot of distance on the boats ahead, allowing me to catch a few more on the run, then one last boat on the final reach to land in...13th. Again. Taylor had a decent race in 10th, Meesemacker was one of the boats I caught on the run and ended up 15th. Barshi had a solid 3rd place, so 4th overall was the best I could hope for, with one race to go and 3 points to gain on Taylor. 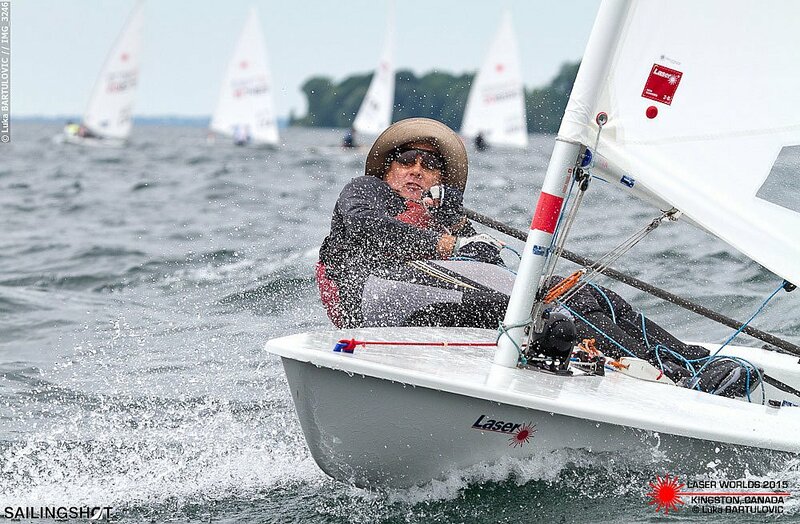 A decent start at the boat allowed me to hold my lane a bit longer than usual, but Ari Barshi, who started about 3 boats further down the line, had great speed and point and I fell down into his line. This is an extremely tough place to stay, as the disturbed wind and waves from the boat ahead make it hard to keep the boat going. That said, I seemed to be staying pretty close to Barshi, and I was determined to do everything I could to not tack for as long as possible. Somehow I managed to hang on til just shy of the port layline and tacked, with Barshi flicking over a boatlength or two later. Managed to round the top mark in 3rd behind Barshi and regatta leader Brett Beyer from Australia. From that point it was just trying to not catch the eyes of the judges on the two downwind legs before once again bee-lining it to the left corner. Barshi tacked back to the middle to cover Beyer and some of the fleet and I was able to pass him, but Beyer caught a nice right shift in the top quarter of the leg and moved into first about 7 lengths ahead of me. The competitor in me wanted to hunt Beyer down, but Rational Marc understood he couldn't afford another yellow flag from the jury. I behaved myself and consolidated the second place, holding it comfortably to the finish. A quick look back revealed my two closest competitors for 4th overall were well back--I'd done it! While I'm a bit disappointed to place 4th, it's a bit of a miracle it happened considering the three 13th place finishes I had to carry. 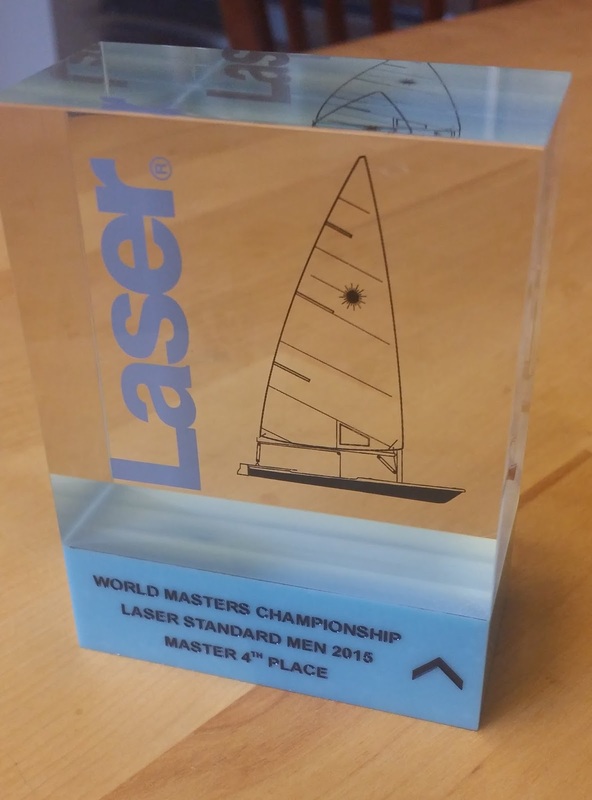 I also won a "cube" (for placing in the Top 5 at a World Championship), an honor that had eluded me for over 30 years of Laser sailing, so that was fun. Obviously starts were an issue, specifically being too conservative. Not helping boldness on the line was getting two yellow flags from the jury--I couldn't afford to be too aggressive and risk being over early. Like so many of us, I can look back at the event and think of places where a boat was lost here, and length there, and those losses made big differences--ramping up the intensity on the racecourse is needed. 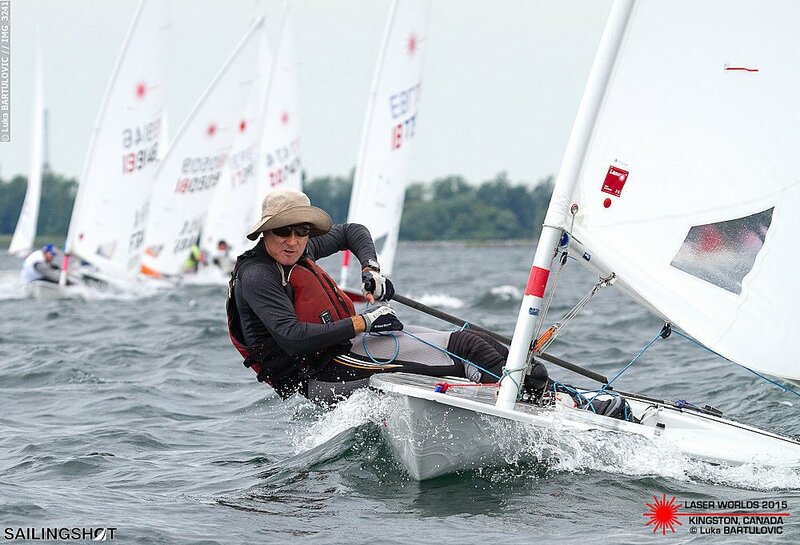 Watch out for the Terminator at the next regatta. Finally, I'd like to thank Guy Rittger for letting me borrow his nice fast hull for this event! Good recap. Well sailed Marc! A wasted day. Or was it...?